“Sporadic-E Peak” (W7W/RS-019) is known to hikers as South Slide Mountain or, simply, Peak 6620. This 8-point summit, located in the northeastern part of Mt. 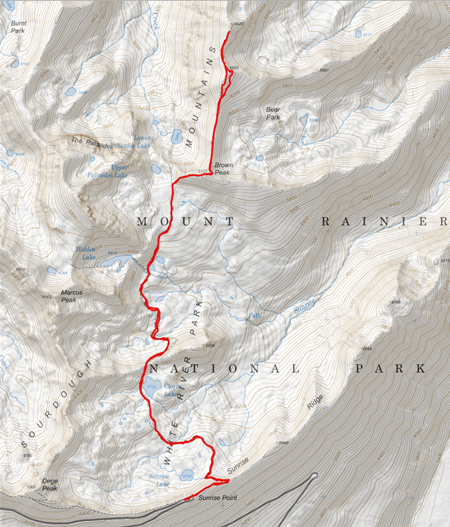 Rainier National Park offers spectacular views at the end of a vigorous, but straightforward hike. Most of the route is on well-established and maintained trails, although the final 1.5 miles is on an unofficial trail. The final mile takes you across a sharp ridge to several smaller (non-SOTA) peaks before arriving at S. Slide. The 9.5 mile round trip yields about 2,500′ of elevation gain. 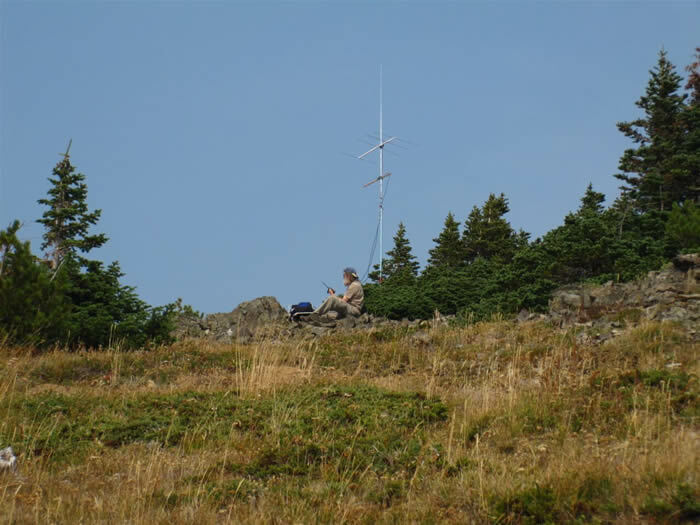 The summit has plenty of comfortable operating locations, with trees for antenna support. My hiking buddy, Dave, picked me up Sunday morning (23 Aug) for the two hour trip to the Sunrise Point parking lot in the Mt. Rainier National Park. Forest fires were raging over eastern Washington, and the winds were carrying the smoke west, to fill the air with a significant haze. The parking lot was nearly full when we arrived about noon. We spoke with one hiker who was abandoning her hiking plans because of the haze. The hike is relatively straightforward. The Palisades trail head is across the road on the hairpin turn of the road. The trail starts at 6,125′, which is not too far below the destination summit at 6,620′. Much of the elevation gain comes from small (200′ to 400′) ascents and descents all along the Palisades trial. At about the half-way point, I heard Tim, KG7EJT, calling CQ on 146.52 from nearby Tahtlum Pk (W7W/MC-023). I updated him on my progress and then monitored his numerous QSOs. At about 3 miles, Dicks Lake is on the right, and from there the trail gently ascends to a saddle at 5,930′. A short distance past this saddle, an unmarked but well-defined trail on the right heads to Brown Peak. The trail ascends steeply gaining 400′. This ascent is the most difficult part of the trip, and it isn’t that difficult. Near the summit of Brown Peak follow the trail to a tee at the ridge and follow the left branch. 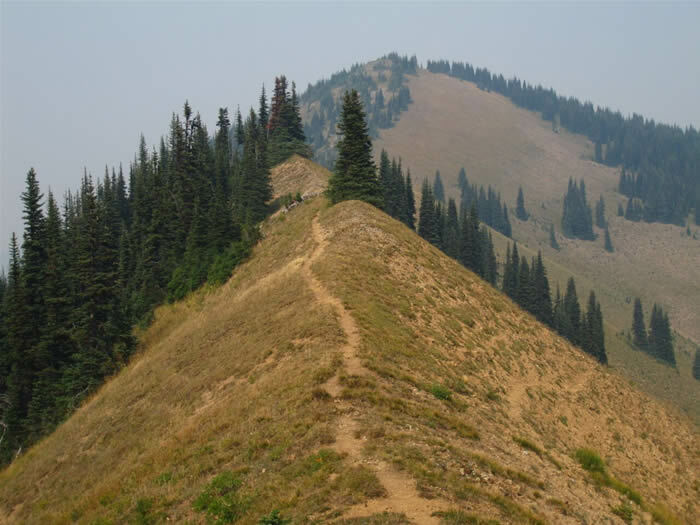 This is the start of a one-mile walk along a N-S ridge with shallow saddles spanning a small summit at 6,200′, a larger summit at 6,500′ and the final approach to S. Slide Mountain. The trail is mostly well defined over the ridge, but sometimes fades away at peaks, only to reappear a short distance later. The best strategy is to stick close to the center-line both along the ridge and intervening summits. On the way to S. Slide, we walked below the summit on the grassy slope east of Peak 6505, but the trip back convinced us that this was more difficult than following the center-line. Leaving Peak 6505, the east side of the ridge becomes more of a cliff. The path follows this rim and walks you up to S. Slide Mtn. There was no scrambling required at any time. I arrived in the activation zone as Tim was calling to check on my progress. He was back to his car by now and gave me a first QSO from the summit. The true summit is on the north side of the crescent-shaped ridge that overlooks an enormous slide zone on the east side. The activation zone follows the entire rim, so I set up on a little rock outcrop south of, and about 5 vertical feet shy of, the true summit. This kept me out of vegetation and, frankly, minimized travel. Some short trees made for excellent antenna supports. I set up for VHF and microwave operations first, and called CQ on 144.2 MHz SSB. Three stations came back to the first call: KD7TS (CN87), VE7AFZ (CN89), and KB7PSG (CN87). While working them, I heard a weak CW signal that peaked up quite strongly to the south. It was KB7W in CN93 on the other side of the Cascade mountains in Bend Oregon! N7MWV (CN86) and WA7BBJ (CN97) were next, followed by AE7FM (CN97) and WA7GCS (CN85) and N7EHP (CN87). It was a veritable grid bonanza on 2m! Mike, KD7TS, and I then successfully worked on 1296.2 MHz FM, 903.2 MHz FM, and 223.5 MHz FM. This was the first 30 minutes. I then set up a longwire antenna and worked a dozen stations on 20m CW. As I was packing everything up, I heard Todd, W7TAO, on Dock Butte (W7W/SK-100), 116 miles to the north. I worked him using a handheld radio. Not bad for 5 watts and a “rubber duck” antenna! The hike back to Sunrise Point was uneventful. As we got back to the car, the sun was painting the smokey skies behind silhouettes of mountains.